Catskills hotels were constantly at war over who had the best indoor pool. 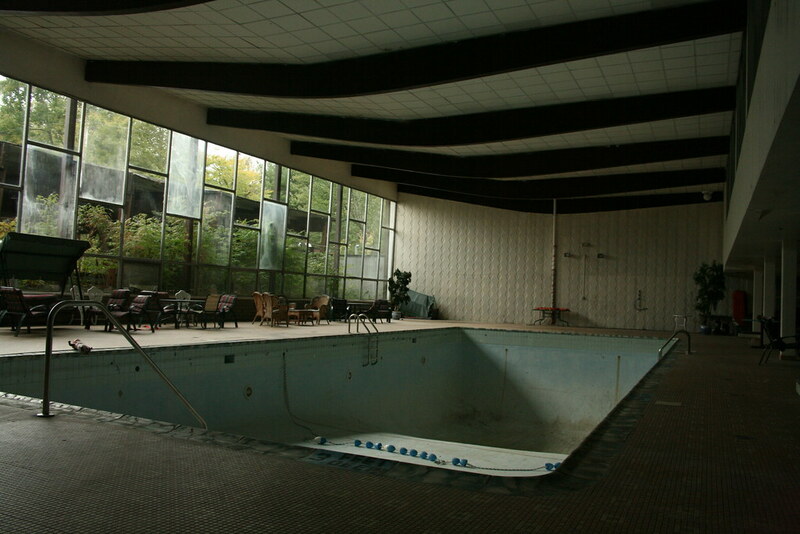 Cliff Ehrlich of the Pines hotel bragged that his indoor pool was the largest, despite that Grossinger's did the same. In fact, Grossinger's pool was standard Olympic size, and the Pines' pool was also Olympic size, but was slightly larger by volume because of its geometry. This pool was clearly not olympic sized, but featured an unusually deep diving end - yet no diving board was found. Another classic Catskills architectural element is the large laminated ceiling beams. These beams are slightly angled downwards before meeting at the center. The owner of the building later mentioned to me that this caused significant problems with standing water on the roof, and the subsequent leaks that followed.